BaretaNews has now learned that the UN Resident and Humanitarian Coordinator for Cameroun, Ms. Allegra Baiocchi, and Cameroon’s Civil Protection Director, Ms. Yap Mariatou were at the launch in Geneva where they warned that there was a drastic increase in humanitarian need across Southern Cameroons. The UN went on to estimates that with needs rising by 31 per cent in a year, around 4.3 million people in the Cameroons – one in six people and mostly women and children – require lifesaving assistance. 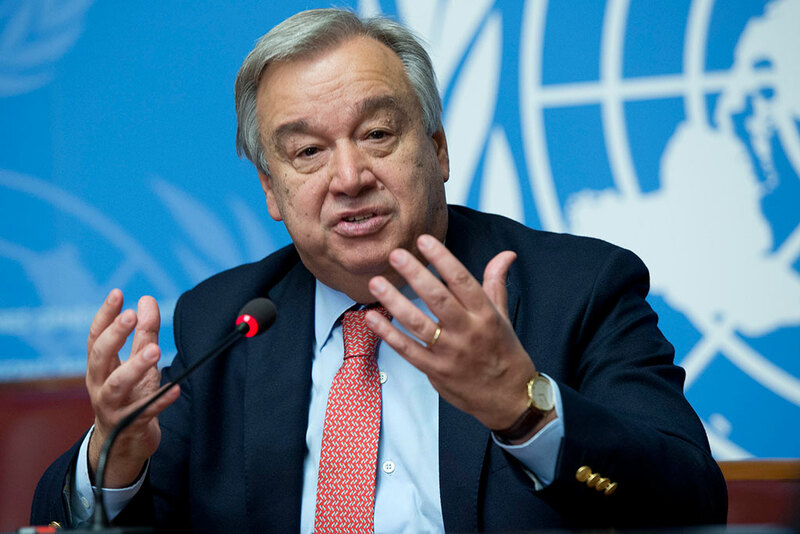 The United Nations went to stipulates that the aggravation of the conflict in Southern Cameroons is the main driver behind the said increase. Insecurity and violence in Southern Cameroons have uprooted 437,000 people from their homes and forced over 32,000 to seek refuge in neighbouring Nigeria. Four million people are now generally affected by the conflict in Southern Cameroons, the UN concluded. UN secretary’s hands are tied because of the bribe he took from biya. biya played his cards well by keeping UN at bay while killing, miming and imprisoning Ambazonians. Guiteris is dismayed at what is happening in Ambazonia but can’t say a word because his mouth is full of gold from biya. Now it does not matter because biya is satisfied to continue killing Ambazonians while the UN Secretary is stuffed with corrupt gold from biya. AND YOU HAVE TO BE CAREFUL AS THE SECRETARY OF THE IG OF AMBAZONIA IS CALLING FOR DESTRUCTION OF ALL U.N. FACILITIES, ETC. IN THE REGION. What has muted the UNITED NATIONS to look on unconcerned for quite a long time only for millions to be killed before coming out finally to say this.Has the UNITED outlived it’s usefulness to the African problem. The whole world is watching you and more so God is watching you. and put them as so-called head of states in Africa to kill and exterminate all African people. called Biya and is defending that piece of garbage as he exterminates a whole nation. They want to steal land in Africa, so their slave boy Biya aka Diaper-man is doing their nasty job while they watch with pleasure and play ostrich. Ans people tell me that I should pray to Jesus to go to heaven. Jesus is white, Mary is white, so the daddy God must be white too. I will be better off with the devil in hell. Life on this planet earth is the real hell for us Africans. Nowhere on this planet are we allowed to live in peace like the other races. After playing the wait-and-see game while hoping that the “Never Again Generation” will give in to the wimps and caprices of the french slave call Biya the UNSG is now talking like he cares. All these pronouncements only makes one sick to the stomach considering the injustice that was visited on the people of Ambazonia by Europeans.